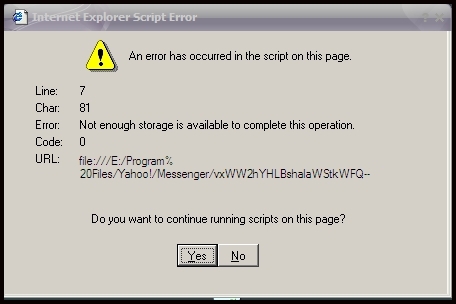 Welcome to My Wikidot site » My Experiences » Script Error in Yahoo Messenger? When you open up a chat window with a buddy, you got a script error window suddenly pop ups. And if you press buzz, nothing happen. Uninstall Yahoo Messenger. I recommend, after you uninstall it, delete Yahoo folder in C:\Programs Files* Go to Internet Explorer option. Open your Internet Explorer, at Tools menu, go to Internet options. In Advanced tab, click on Restore Default or Reset. Check all, and then click Ok. Install again your Yahoo Messenger.